Erasable programmable read-only memory integrated circuits. These packages have a transparent window that shows the die inside. The window allows the memory to be erased by exposing the chip to ultraviolet light. An integrated circuit or monolithic integrated circuit (also referred to as an IC, a chip, or a microchip) is a set of electronic circuits on one small plate ("chip") of semiconductor material, normally silicon. This can be made much smaller than a discrete circuit made from independent components. ICs can be made very compact, having up to several billion transistors and other electronic components in an area the size of a fingernail. The width of each conducting line in a circuit can be made smaller and smaller as the technology advances; in 2008 it dropped below 100 nanometer, and now is tens of nanometers. ICs have two main advantages over discrete circuits: cost and performance. Cost is low because the chips, with all their components, are printed as a unit by photolithography rather than being constructed one transistor at a time. Furthermore, packaged ICs use much less material than discrete circuits. Performance is high because the IC's components switch quickly and consume little power (compared to their discrete counterparts) as a result of the small size and close proximity of the components. As of 2012, typical chip areas range from a few square millimeters to around 450 mm2, with up to 9 million transistors per mm2. Circuits meeting this definition can be constructed using many different technologies, including thin-film transistor, thick film technology, or hybrid integrated circuit. However, in general usage integrated circuit has come to refer to the single-piece circuit construction originally known as a monolithic integrated circuit. The idea of the integrated circuit was conceived by Geoffrey W.A. Dummer (1909–2002), a radar scientist working for the Royal Radar Establishment of the British Ministry of Defence. Dummer presented the idea to the public at the Symposium on Progress in Quality Electronic Components in Washington, D.C. on 7 May 1952. He gave many symposia publicly to propagate his ideas, and unsuccessfully attempted to build such a circuit in 1956. Newly employed by Texas Instruments, Kilby recorded his initial ideas concerning the integrated circuit in July 1958, successfully demonstrating the first working integrated example on 12 September 1958. In his patent application of 6 February 1959, Kilby described his new device as “a body of semiconductor material … wherein all the components of the electronic circuit are completely integrated.” The first customer for the new invention was the US Air Force. Fairchild Semiconductor was also home of the first silicon-gate IC technology with self-aligned gates, the basis of all modern CMOS computer chips. The technology was developed by Italian physicist Federico Faggin in 1968, who later joined Intel in order to develop the very first single-chip Central Processing Unit (CPU) (Intel 4004), for which he received the National Medal of Technology and Innovation in 2010. In the early days of simple integrated circuits, the technology's large scale limited each chip to only a few transistors, and the low degree of integration meant the design process was relatively simple. Manufacturing yields were also quite low by today's standards. As the technology progressed, millions, then billions of transistors could be placed on one chip, and good designs required thorough planning, giving rise to new design methods. 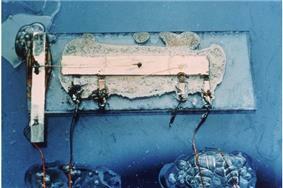 The first integrated circuits contained only a few transistors. Called "small-scale integration" (SSI), digital circuits containing transistors numbering in the tens provided a few logic gates for example, while early linear ICs such as the Plessey SL201 or the Philips TAA320 had as few as two transistors. The term Large Scale Integration was first used by IBM scientist Rolf Landauer when describing the theoretical concept , from there came the terms for SSI, MSI, VLSI, and ULSI. SSI circuits were crucial to early aerospace projects, and aerospace projects helped inspire development of the technology. Both the Minuteman missile and Apollo program needed lightweight digital computers for their inertial guidance systems; the Apollo guidance computer led and motivated the integrated-circuit technology, while the Minuteman missile forced it into mass-production. The Minuteman missile program and various other Navy programs accounted for the total $4 million integrated circuit market in 1962, and by 1968, U.S. Government space and defense spending still accounted for 37% of the $312 million total production. The demand by the U.S. Government supported the nascent integrated circuit market until costs fell enough to allow firms to penetrate the industrial and eventually the consumer markets. The average price per integrated circuit dropped from $50.00 in 1962 to $2.33 in 1968. Integrated circuits began to appear in consumer products by the turn of the decade, a typical application being FM inter-carrier sound processing in television receivers. Integrated circuits such as 1K-bit RAMs, calculator chips, and the first microprocessors, that began to be manufactured in moderate quantities in the early 1970s, had under 4000 transistors. True LSI circuits, approaching 10,000 transistors, began to be produced around 1974, for computer main memories and second-generation microprocessors. The final step in the development process, starting in the 1980s and continuing through the present, was "very large-scale integration" (VLSI). The development started with hundreds of thousands of transistors in the early 1980s, and continues beyond several billion transistors as of 2009. Multiple developments were required to achieve this increased density. Manufacturers moved to smaller design rules and cleaner fabrication facilities, so that they could make chips with more transistors and maintain adequate yield. The path of process improvements was summarized by the International Technology Roadmap for Semiconductors (ITRS). Design tools improved enough to make it practical to finish these designs in a reasonable time. The more energy efficient CMOS replaced NMOS and PMOS, avoiding a prohibitive increase in power consumption. 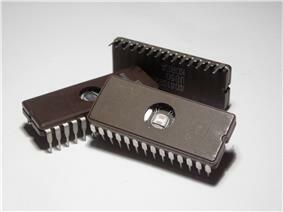 In 1986 the first one megabit RAM chips were introduced, containing more than one million transistors. Microprocessor chips passed the million transistor mark in 1989 and the billion transistor mark in 2005. The trend continues largely unabated, with chips introduced in 2007 containing tens of billions of memory transistors. Among the most advanced integrated circuits are the microprocessors or "cores", which control everything from computers and cellular phones to digital microwave ovens. Digital memory chips and application-specific integrated circuits (ASIC)s are examples of other families of integrated circuits that are important to the modern information society. While the cost of designing and developing a complex integrated circuit is quite high, when spread across typically millions of production units the individual IC cost is minimized. The performance of ICs is high because the small size allows short traces which in turn allows low power logic (such as CMOS) to be used at fast switching speeds. ICs have consistently migrated to smaller feature sizes over the years, allowing more circuitry to be packed on each chip. This increased capacity per unit area can be used to decrease cost or increase functionality—see Moore's law which, in its modern interpretation, states that the number of transistors in an integrated circuit doubles every two years. In general, as the feature size shrinks, almost everything improves—the cost per unit and the switching power consumption go down, and the speed goes up. However, ICs with nanometer-scale devices are not without their problems, principal among which is leakage current (see subthreshold leakage for a discussion of this), although innovations in high-κ dielectrics aim to solve these problems. Since these speed and power consumption gains are apparent to the end user, there is fierce competition among the manufacturers to use finer geometries. This process, and the expected progress over the next few years, is described by the International Technology Roadmap for Semiconductors (ITRS). In current research projects, integrated circuits are also developed for sensoric applications in medical implants or other bioelectronic devices. Particular sealing strategies have to be taken in such biogenic environments to avoid corrosion or biodegradation of the exposed semiconductor materials. As one of the few materials well established in CMOS technology, titanium nitride (TiN) turned out as exceptionally stable and well suited for electrode applications in medical implants. Digital integrated circuits can contain anywhere from one to millions of logic gates, flip-flops, multiplexers, and other circuits in a few square millimeters. The small size of these circuits allows high speed, low power dissipation, and reduced manufacturing cost compared with board-level integration. These digital ICs, typically microprocessors, DSPs, and microcontrollers, work using binary mathematics to process "one" and "zero" signals. ICs can also combine analog and digital circuits on a single chip to create functions such as A/D converters and D/A converters. Such mixed-signal circuits offer smaller size and lower cost, but must carefully account for signal interference. Semiconductor ICs are fabricated in a layer process which includes three key process steps – imaging, deposition and etching. The main process steps are supplemented by doping and cleaning. Mono-crystal silicon wafers (or for special applications, silicon on sapphire or gallium arsenide wafers) are used as the substrate. Photolithography is used to mark different areas of the substrate to be doped or to have polysilicon, insulators or metal (typically aluminium) tracks deposited on them. The earliest integrated circuits were packaged in ceramic flat packs, which continued to be used by the military for their reliability and small size for many years. Commercial circuit packaging quickly moved to the dual in-line package (DIP), first in ceramic and later in plastic. 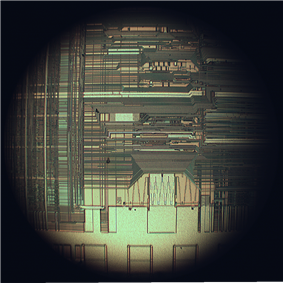 In the 1980s pin counts of VLSI circuits exceeded the practical limit for DIP packaging, leading to pin grid array (PGA) and leadless chip carrier (LCC) packages. Surface mount packaging appeared in the early 1980s and became popular in the late 1980s, using finer lead pitch with leads formed as either gull-wing or J-lead, as exemplified by small-outline integrated circuit – a carrier which occupies an area about 30–50% less than an equivalent DIP, with a typical thickness that is 70% less. This package has "gull wing" leads protruding from the two long sides and a lead spacing of 0.050 inches. In the late 1990s, plastic quad flat pack (PQFP) and thin small-outline package (TSOP) packages became the most common for high pin count devices, though PGA packages are still often used for high-end microprocessors. Intel and AMD are currently transitioning from PGA packages on high-end microprocessors to land grid array (LGA) packages. When multiple dies are put in one package, it is called SiP, for System In Package. When multiple dies are combined on a small substrate, often ceramic, it's called an MCM, or Multi-Chip Module. The distinction between a big MCM and a small printed circuit board is sometimes fuzzy. Most integrated circuits large enough to include identifying information include four common sections: the manufacturer's name or logo, the part number, a part production batch number and serial number, and a four-digit code that identifies when the chip was manufactured. Extremely small surface mount technology parts often bear only a number used in a manufacturer's lookup table to find the chip characteristics. The possibility of copying by photographing each layer of an integrated circuit and preparing photomasks for its production on the basis of the photographs obtained is the main reason for the introduction of legislation for the protection of layout-designs. National laws protecting IC layout designs have been adopted in a number of countries. In the 1980s, programmable logic devices were developed. These devices contain circuits whose logical function and connectivity can be programmed by the user, rather than being fixed by the integrated circuit manufacturer. This allows a single chip to be programmed to implement different LSI-type functions such as logic gates, adders and registers. Current devices called field-programmable gate arrays can now implement tens of thousands of LSI circuits in parallel and operate up to 1.5 GHz. The techniques perfected by the integrated circuits industry over the last three decades have been used to create very small mechanical devices driven by electricity using a technology known as microelectromechanical systems. These devices are used in a variety of commercial and military applications. Example commercial applications include DLP projectors, inkjet printers, and accelerometers and MEMS gyroscopes used to deploy automobile airbags. transistors built from other materials: organic field-effect transistor, etc. Future developments seem to follow the multi-core multi-microprocessor paradigm, already used by the Intel and AMD dual-core processors. Rapport Inc. and IBM started shipping the KC256 in 2006, a 256-core microprocessor. Intel, as recently as February–August 2011, unveiled a prototype, "not for commercial sale" chip that bears 80 cores. Each core is capable of handling its own task independently of the others. This is in response to the heat-versus-speed limit that is about to be reached using existing transistor technology (see: thermal design power). This design provides a new challenge to chip programming. Parallel programming languages such as the open-source X10 programming language are designed to assist with this task. Since the early 2000s, the integration of optical functionality (optical computing) into silicon chips has been actively pursued in both academic research and in industry resulting in the successful commercialization of silicon based integrated optical transceivers combining optical devices (modulators, detectors, routing) with CMOS based electronics. The Motorola 6800 series of computer-related chips, leading to the 68000 and 88000 series (used in some Apple computers and in the 1980s Commodore Amiga series). The LM-series of analog integrated circuits. ^ "Intel to Invest More than $5 Billion to Build New Factory in Arizona". Retrieved 3 February 2013. ^ "Intel® 22nm Technology". Retrieved 26 July 2014. ^ "Integrated circuits help Invention". Integratedcircuithelp.com. Retrieved 2012-08-13. ^ DE 833366 W. Jacobi/SIEMENS AG: „Halbleiterverstärker“ priority filing on 14 April 1949, published on 15 May 1952. ^ "The Hapless Tale of Geoffrey Dummer", (n.d.), (HTML), Electronic Product News, accessed 8 July 2008. ^ George Rostky, (n. d.), "Micromodules: the ultimate package", (HTML), EE Times, accessed 8 July 2008. ^ Winston, Brian (1998). Media Technology and Society: A History : From the Telegraph to the Internet. Routledge. p. 221. ^ "Texas Instruments – 1961 First IC-based computer". Ti.com. Retrieved 2012-08-13. ^ Kurt Lehovec's patent on the isolation p–n junction: U.S. Patent 3,029,366 granted on 10 April 1962, filed 22 April 1959. Robert Noyce credits Lehovec in his article – "Microelectronics", Scientific American, September 1977, Volume 23, Number 3, pp. 63–9. ^ Mindell, David A. (2008). Digital Apollo: Human and Machine in Spaceflight. The MIT Press. ^ Ginzberg, Eli (1976). Economic impact of large public programs: the NASA Experience. Olympus Publishing Company. p. 57. ^ Meindl, J.D. "Ultra-large scale integration". ieee.org. IEEE. Retrieved 21 September 2014. ^ Topol, A.W. ; Tulipe, D.C.La; Shi, L; et., al. "Three-dimensional integrated circuits". ieee.org. International Business Machines Corporation (IBM). Retrieved 21 September 2014. ^ A.H.D. Graham, J. Robbins, C.R. Bowen, J. Taylor (2011). "Commercialisation of CMOS Integrated Circuit Technology in Multi-Electrode Arrays for Neuroscience and Cell-Based Biosensors". Sensors 11: 4943–4971. ^ H. Hämmerle, K. Kobuch, K. Kohler, W. Nisch, H. Sachs, M. Stelzle (2002). "Biostability of micro-photodiode arrays for subretinal implantation". Biomat. 23: 797–804. ^ M. Birkholz, K.-E. Ehwald, D. Wolansky, I. Costina, C. Baristyran-Kaynak, M. Fröhlich, H. Beyer, A. Kapp, F. Lisdat (2010). "Corrosion-resistant metal layers from a CMOS process for bioelectronic applications". Surf. Coat. Technol. 204 (12–13): 2055–2059. 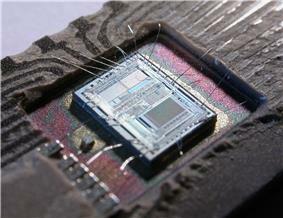 ^ "Breaking News-IBM, AMD Expect 45-Nanometer Chips in Mid-2008". Itjungle.com. 2006-12-12. Retrieved 2013-09-08. ^ NOBUO TAKEDA. "MEMS applications of Ball Semiconductor Technology". ^ A. Narasimha et al. (2008). 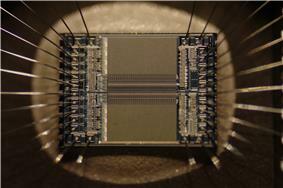 "A 40-Gb/s QSFP optoelectronic transceiver in a 0.13 µm CMOS silicon-on-insulator technology". Proceedings of the Optical Fiber Communication Conference (OFC): OMK7. Hodges, David; Jackson, Horace; Saleh, Resve (2003). Analysis and Design of Digital Integrated Circuits. McGraw-Hill Science/Engineering/Math. Mead, Carver; Conway, Lynn (1980). Introduction to VLSI systems. Addison Wesley Publishing Company. Arjun N. Saxena (2009). Invention of Integrated Circuits: Untold Important Facts. World Scientific. Stephen P. Marsh (2006). Practical MMIC design. Artech House. Note: It's relatively common to find packages that contain other components than their designated ones, such as voltage regulators in transistor packages, etc.